Maybe you think you generally eat well. Perhaps you make it a priority to eat really healthy food. Wonderful! But optimal health is not only about WHAT foods you’re eating, but WHEN and HOW. Even when nourishing ourselves with the appropriate food for our individual needs, if we’re eating at times that aren’t optimal, or eating under the wrong circumstances, our overall health and well being can be negatively impacted. In this series we’ll address common ways that both the TIME we eat and the WAY we eat affect us. Even if we’re not experiencing digestive issues, WHEN and HOW we eat affects how we absorb and assimilate food, which in turn impacts everything; our sleep, energy level, mood, skin, weight, and much, much more. What we do most of the time matters more than what we do some of the time. HOW TO EAT BETTER (WITHOUT CHANGING WHAT YOU EAT) PART ONE: Eat dinner earlier. 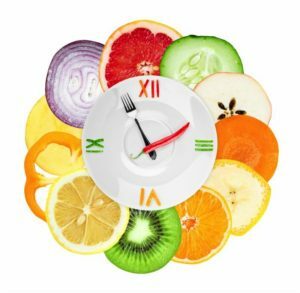 Eating small amounts all day without a substantial midday meal might seem to save time and stave off hunger, but it’s problematic and leaves us ravenous by the evening. When we eat the majority of our food in the evening, we're asking our body to work hard to digest that late meal. Ideally we should be sleeping, and digesting on a deeper level. No matter WHAT we’re eating, if it’s late in the evening, even the healthiest organic, sustainable meal, it cannot be optimally absorbed and assimilated. Our bodies weren’t designed to fully digest big meals at this time, and in a horizontal position (when when we’re sleeping) digestion is impeded, causing distress including acid reflux. (Yes, that’s why we experience heartburn when eating certain foods at night but not at any other times). Digestion is strongest in the middle of the day. Just as the sun is highest in the sky around noon, our digestive fire is also strongest. Skimping on lunch in favor of grazing throughout the afternoon can result in feeling cranky or sleepy, because our bodies have not been fed the nourishment they need and require for optimal energy. Recently when friends were visiting, I ate dinner later than usual three out of four nights. Although I ate a substantial lunch, dinner was a couple of hours later (after 7:30pm) than normal. I didn’t overeat, and the quality of the restaurant food was excellent (and the meals delicious). Subsequently I went to sleep later those nights and although I tried, just couldn't sleep much later the next mornings. It was exhausting. When our bodies are in the process of actively digesting a meal, we don’t experience the deeper rest required. Had it been just one night eating late, I might have been ok, but three out of four nights was just too much for me personally. With this knowledge, I was able to get right back on track with my schedule, and feel energized once again. How do we shift this habit, knowing it may affect both our sleep and energy level? Remember, it’s NOT what we do occasionally that matters as much as what we do most of the time that affects our overall health and well being. Here are some strategies to begin. Plan larger lunches. Begin on Saturday or Sunday when you have more flexibility. When eating a larger meal in the middle of the day, you won’t be as hungry in the evening, and have a smaller dinner. Push back your dinnertime in small increments. This becomes easier in the Fall and Winter when it’s darker earlier. Start by eating just 15 minutes sooner- that’s it. Many of my students report how much better they feel just from this one tip alone.